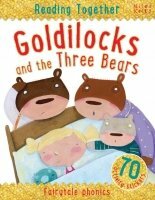 Reading Together Goldilocks and the Three Bears is a wonderful classic fairytale, carefully retold to help children aged 5+ refine their phonic skills. Each page focuses on a distinct sound, using sound out, word building and spotting activities with reusable stickers to support fine motor skills and problem-solving skills. Children are also rewarded for both effort and success along the way, with gold star stickers, to help them to gain confidence. Throughout the series of eight books, all 44 phonemes (sounds) that children are taught at school are practised. How to use this book: • Read aloud so your child can hear you emphasize the sounds that are highlighted in red. • Sound out together the highlighted sounds. • Try the sticker activities to practise building each word with the separate sounds. • Retell the story with your child using the pictures and key sounds shown.